Ezekiel was both a prophet and a priest to the Hebrew people during the 6th century BCE, probably beginning before the conquest of Judah and then going into the Babylonian exile. Ezekiel, himself, was actually one of the ones who was exiled, who lost his place of identity and home. His message is clear: he assures his hearers of God’s ever-abiding presence among them, of God’s involvement in what happens in their lives and in the world around them. To these people who had been ejected from their homes and who were now wandering in hopelessness and despair, this was a message of real hope. According to Ezekiel, God would restore their lives. The first part of the passage we read is Ezekiel’s vision or prophecy; the last part is an interpretation of that vision. The valley here is probably referring to the plains between the Tigris and Euphrates Rivers, which was a dry and arid place. There is some speculation that this is the site of a battle at some point during this siege. The bones there are dry, brittle, lifeless, and broken. Whether this is meant literally (as in the case of a battlefield) or metaphorically (as in the case of lost homelands), they symbolize the lost hopes and despair of the exiles themselves. For them, the kingdom of Israel is gone. The temple is gone and the city lies in ruins. It is dead and their lives have gone away with it. And then, according to Ezekiel, “the hand of the Lord came upon me.” In The Message, Eugene Peterson says that “God grabs me”. Think of that image. Here was Ezekiel, probably feeling the weight of despair of those around him and virtual helplessness at what he could do as their leader. But then “God GRABBED him…I have something to show you.” And there in the middle of death and destruction and despair, God showed him what only God could see. And then God breathes life into these bones. The word “breath” here is the Hebrew word, ru’ah. We don’t really have a good translation. It means breath; it also means wind or spirit. It is the very essence of God. And the bones come to life. The idea of God creating and recreating over and over again is not new to us. But most of us do not this day live in exile. We are at home; we are residing in the place where our identity is claimed. So how can we, then, understand fully this breathing of life into death, this breathing of hope into despair? The image is a beautiful one and yet we sit here breathing just fine. We seldom think of these breaths as the very essence of God. In the hymn, “I’ll Praise My Make While I’ve Breath”, Isaac Watts writes the words, “I’ll praise my God who lends me breath…” Have you ever thought of the notion of God “lending you breath”? Think about it. In the beginning of our being, God lent us breath, ru’ah, the very essence of God. And when our beings become lifeless and hopeless, that breath is there again. And then in death, when all that we know has ended, God breathes life into dry, brittle, lifeless bones yet again. Yes, it is a story of resurrection. God gave us the ability to breathe and then filled us with the Breath of God. We just have to be willing to breathe. It’s a great Lenten image. It involves inhaling. It also involves exhaling. So exhale, breathe out all of that stuff that does not give you life, all of that stuff that dashes hopes and makes you brittle, all of that stuff that you hold onto so tightly that you cannot reach for God. Most of us sort of live our lives underwater, weighed down by an environment in which we do not belong. We have to have help to breathe, so we add machines and tanks of air. But they eventually run out and we have to leave where we are and swim to the top. And there we can inhale the very essence of God, the life to which we belong. God lends us breath until our lives become one with God and we can breathe forever on our own. Do you ever feel like God grabs you? What does that image mean to you of God breathing life into death? How pertinent do you think this image is to today’s world? How faithfully do you think we really believe that God can make all things new? How ready are we to let God breathe new life into us? The main theme on the surface of Romans 7 and the first part of Romans 8 is the Jewish Law, the Torah and what it really means to live under God’s law. And for some scholars, the passage that we read lies at the very heart of this section on the Torah. In fact, Romans 8 is said to have been Paul’s greatest masterpiece, the epitome of his work. For us, the passage may almost be TOO familiar. There have been a multitude of prayers that have been created from it and Bach made it the backbone of a whole cantata. In verse 5, right before our passage, Paul lays out the two ways of living—two mindsets—of the “flesh” and of the “Spirit”. For Paul, of the “flesh” is not as humans but rather a perversion of who we should be as humans. But it is the “way of the Spirit” that brings life. And since, as followers of Christ, the Spirit of Christ dwells in us, we do have life. It is like the Ezekiel passage. If we live in the “way of the Spirit”, the essence of God will be breathed into us and bring us to life. That is the way to true freedom. Here, for Paul, living within the “law”, living within the Spirit, is living within the power of love. Often the idea of the “mind” is set against the idea of the “Spirit”, as if the two are not compatible existing together. But here Paul admonishes the reader to “set the mind on the Spirit”. For Paul, the “body” (GR. soma) is inherently neutral. It is not “bad”, per se, the way we often try to make it. But without the Spirit, the essence of Life, breathed into it, it remains neutral and ultimately dies. The two belong together. God’s Spirit brings breath and life. Once again, it is a good Lenten passage. We tend to get wrapped up in those things of the “flesh”—our needs, our desires, our fears. Paul is not saying that we dispense with them as bad. Paul is making the claim that the Spirit can breathe new life into them. There is no sense in fighting to sustain our identity apart and away from God. It will ultimately die. Paul has more of a “big picture” understanding than we usually let him have. He’s saying that the flesh in and of itself is not bad but the Spirit brings it to life. I don’t think he is drawing a dividing line between darkness and light, between mind and Spirit, between death and life; rather, he is claiming that God’s Spirit has the capability of crossing that line, of bringing the two together, infused by the breath of God. It is a spirituality that we need, one that embraces all of life. It is one that embraces the Spirit of Life that is incarnate in this world, even this world. I mean, really, what good would the notion of a disembodied Spirit really do us? Isn’t the whole point that life is breathed into the ordinary, even the mundane, so that it becomes holy and sacred, so that it becomes life? What, for you, is the Spirit of God in you? What does that mean for our lives? What happens when we separate the “mind” and the “Spirit” in our lives? This entire lectionary passage contains the account of the raising of Lazarus. But the bulk of the story is not focused on Lazarus’ raising but rather on the preparations for it. This story is only told in The Gospel According to John, so it is unclear from where the story comes. There is, of course, no way to prove the “facts” of this miracle, but it sets the stage for Jesus’ own raising and what that means for the world. It is important to note that the Jewish understanding was that one’s soul “hovered” around the body for three days, but Lazarus has been dead for four days. In their understanding, his soul was gone; his body was dead, dead, dead. So the story sets the stage for the beginning of God’s new age. The point is that the way to experience this power over death is to believe. When Jesus asks Martha, ‘Do you believe this?” he asks her to believe both that he is the resurrection and the life and that as the resurrection and the life he defeats the power of death. It means that death is reintegrated as a part of life, rather than a feeble end. For many, this is one of those odd, somewhat problematic texts. After all, people don’t usually get up and walk out of tombs into the land of the living. This story challenges norms and even reality, to some extent. Perhaps that is the point. Perhaps it sort of jolts us into the realization that God is capable of more, that God will go beyond what we plan, what we think, even what we imagine. And yet, “Jesus wept.” In the older translations, it is supposedly the shortest verse in the Bible. Jesus’ tears remind us that grief is real and that God realizes that and truly cares what happens to us. Ironically, this is the act that would ultimately cost Jesus his life. After this, the Sanhedrin’s step in and the journey to Jerusalem, mock trial and all, escalates. There is no turning back. Perhaps it should be our turn to weep. But we are given a new hope and a new promise. Jesus said, “Unbind him, and let him go.”…He will do the same for us. Even as this was a foreshadowing of the Resurrection, it was also a foretelling of what Jesus would do on the Cross. And the love that Jesus felt for Lazarus foretells that love for humanity that took Jesus to the Cross. This is a good Lenten story. It is the story about the in-between. Some things don’t make sense. Some things don’t go like we plan. Creation groans towards its ultimate promise. And so we wait…and we believe. 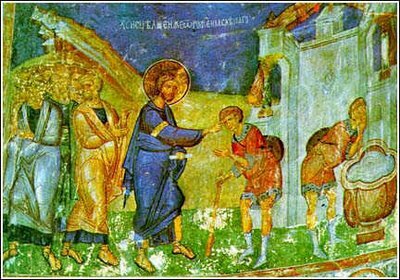 Until recently, I have seen this story of the raising of Lazarus as an inaccessible and, in some respects, unappealing story. Lazarus is not fleshed out as a character. All we know about him is that Jesus loved him and he got sick and died. His sisters, whom we have met in Luke’s gospel, seem a little passive aggressive. Their initial note doesn’t ask Jesus to come. It just informs him of their brother’s illness. Then, when he approaches their town, they each, separately, run out and lay the identical guilt trip on him. “Lord, if you had been here, our brother would not have died.” As for Jesus, he is never more certain about the panoramic big picture than here. Lazarus’ illness will not end in death, and it will be for the glory of the Son of God. He is, at the same time, seldom more disturbed by the sights and sounds of a specific scene: the sound of mourners wailing and the stench of death. So for many years, I have read this text and thought hmm, this is odd. And read on. So much for true confessions. This past week, I have had an epiphany. It is probably one you the reader have already had, and if so, I apologize in advance for pointing out what has long been obvious to you. The epiphany is that we are to see ourselves in Lazarus and see the miracle of his restoration of physical life as the beginning of our entry into eternal life that begins the moment we accept Jesus’ offer of relationship with us. The sequence of the Gospel of John is the opposite of the children’s game “Show and Tell.” It is “Tell and Show.” The Prologue tells us that Jesus is the light and life of the world (Jn. 1:4, 5). The giving of sight to the man born blind (Jn. 9) and the raising of Lazarus from the dead (Jn. 11) show us Jesus giving light and life to particular human beings. We are invited to see ourselves in them and him in our lives. We are to see ourselves in Lazarus, whose name, a shortened form of Eleazar, means “God helps.” He is from a town whose name, Bethany, means “House of Affliction.” So God helps one who suffers from affliction. John takes a friendship between Jesus and this family and an event that has the quality of reminiscence and shapes it to his theological purpose (Brown, 431). Lazarus is the “one Jesus loves”; he represents all those whom Jesus loves, which includes you and me and all humankind. This story, then, is the story of our coming to life from death in this present moment, not just in a future event. What does the image of Jesus weeping mean for you? What does it mean to truly say that we believe the words “I am the Resurrection and the Life”? The books of 1 and 2 Samuel witness to one of the must crucial periods of transition and change in the story of ancient Israel. At its opening, Israel is sort of a loose federation of tribes and at the end of the second Book of Samuel, there is an emerging monarchy firmly in place under David. Originally, the books were one book. The oldest Hebrew manuscript includes both on a single scroll. The division may have been introduced by later Greek translators (the Septuagint) just to make the manuscripts a more manageable size. The division did not appear until the fifteenth century. The passage that we read, the anointing of David, sets David out as “God’s choice”. So the human actions that are depicted represent the carrying out of a Divine plan. The account of David’s anointing by the prophet Samuel was probably placed as an introduction to the history of David’s rise to power. The key theme, although it is translated in many ways, means “to see”, making that an emphasis of the passage—to see what God has done. As God’s anointed one, David becomes God’s agent and prophet who can then be anointed, rejected, or confirmed. Once again, we are reminded of the unlikely vessels of God’s grace. God’s choice is David, a shepherd, an eighth son (eighth connoting the “next thing”, a new beginning), from the village of Bethlehem, from a family that has no obvious pedigree. It reminds us that God finds possibilities for grace in the most unexpected places. This is the way that God lays the hope for a new future. This is the way that God calls us to a “faithful seeing”. This passage shows us that God calls ordinary people to do extraordinary things. This passage includes the warning against looking only at appearances. That is part of that “faithful seeing”—to look past the obvious. There’s another unlikely one here, though. What about Samuel? God called him to go to Jesse the Bethlehemite and anoint a new king. Well, I’m pretty sure that Saul would not have been impressed with that had he found out. What if Samuel had just said, “You know, God, I would really rather not. That just doesn’t work into my plan.”? What would have happened if David has just turned and walked away? Well, I’m pretty sure that God would have found someone else, but the road would have turned away from where it was. It would have been a good road, a life-filled road, a road that would have gotten us where we needed to be. But it wouldn’t have been the road that God envisioned it to be. We know how it all turned out. David started out by playing the supposed evil out of Saul with his lyre. He ultimately became a great king (with several bumps along the way!) and generations later, a child was brought forth into the world, descended from David. The child grew and became himself anointed—this time not for lyre-playing or kingship but as Messiah, as Savior, as Emmanuel, God-Incarnate. And in turn, God then anoints the ones who are to fall in line. “You’re the one”. Do we even get a choice, you ask? Sure, you get a choice. You can close yourself off and try your best to hold on to what is really not yours anyway or you can walk forward into life as the one anointed to build the specific part of God’s Kingdom that is yours. We are all called to different roads in different ways. But the calling is specifically yours. And in the midst of it, there is a choice between death and life. Is there a choice? Not so much! Seeing the way to walk is not necessary about seeing where the road is going. So just keep walking and enjoy the scenery along the way! b. What does the idea of the signs of God’s grace appearing in unlikely vessels mean for you? c. Why is that difficult for us to see? Most scholars agree that this letter was not written by Paul, but rather pseudonymously by one of his disciples or students. For the writer of this letter, the focus of God’s mystery is not the cosmic Christ, as it is for Paul, but the church as the “body of Christ”. So there’s lots of “body” language in the letter—Christ as head, church as body. Ephesians often refers to believers as “saints” and tends to focus on being holy and blameless as a body in order to unite with Christ (the head). The passage that we read contains an insistence that there is a separation between “children of light” and “those who are disobedient”. There is a more dualistic nature to the writings than many of Paul’s actual writings. (Light vs. Dark) Ephesians may anticipate that Christians will be active moral agents in the world. But that is not limited to our own conduct. Rather we should move beyond refusal to participate in evil and expose evil deeds around us. It is another focus on “enlightened or faithful seeing”. This passage essentially contends that to “walk in the light” means that we are no longer naïve. It is not about being happy or “blessed” in terms of how this world sees “blessed”. The world is illumined by our faith. We now must own a commitment to justice and compassion for all of Creation. Light is goodness and justice and truth. It is not about merely living a moral and righteous life; it is about witnessing to the light that is Christ. Light and darkness cannot exist together. As the passage says, light makes all things visible and then all things visible become light. The Light of Christ makes that on which is shines light itself. The passage exhorts us to wake up and see the light and then live as children of that light; in essence, we are called to become light. [There is much talk] about “traditional values” and “family values.” Almost always these values relate to personal rather than social morality. For [many people] have trouble not only seeing love as the core value of personal life but even more trouble seeing love as the core value of our communal life—the love that lies on the far side of justice. Without question, family responsibility, hard work, compassion, kindness, religious piety—all these individual virtues are of enduring importance. But again, personal morality doesn’t threaten the status quo. Furthermore, public good doesn’t automatically follow from private virtue. A person’s moral character, sterling though it may be, is insufficient to serve the cause of justice, which is to challenge the status quo, to try to make what’s legal more moral, to speak truth to power, and to take personal or concerted action against evil, whether in personal or systemic form…. b. How does this speak to the way our world looks at “morals” and “morality” today? c. What does that mean for us personally? This entire lectionary passage contains the healing miracle and then is followed by dialogue and some interrogation about that miracle. The opening of the passage contains some more language about darkness and light, night and day as well as the depiction of Jesus as the “light of the world”. This plays right into the healing miracle in which Jesus brings sight to someone who had none. In essence, Jesus is bringing light to one who had only darkness. The Pool of Siloam from our Gospel passage was located just beyond the city walls of Jerusalem. It was actually the only permanent water source of the city during the first century, fed by the waters of the Gihon Spring which was diverted through the rather complex water system in Hezekiah’s Tunnel, which was built in the 8th century BCE. You’ll also see it referred to as the Pool of Shelah or the waters of Shiloah. It was outside the city gates so this man, who, in essence, would have been considered unclean, could wash there but it was near enough to the city gates that the water could have been carried into the temple. It’s interesting that the first thing that people address here is sin. The man has been apparently blind from birth and their first thought is sin? Did he commit the sin? What an odd question! Was he supposed to have committed some sin in the womb that was apparently terrible enough to blind him for life? Or did his parents sin? It’s an odd line of questioning to us. They see a man that has missed out on so much of what life holds, that has never seen what you and I take for granted every day, and they immediately want to know what he did wrong or what his parents did wrong to deserve that. But Jesus doesn’t see a sinner; Jesus sees a child of God. And so he reaches down into the cool dirt and picks up a piece of the earth. He then spits into his hand and lovingly works the concoction into a sort of paste. And then, it says, he spreads the mud into the man’s eyes and tells him to go wash in the Pool of Siloam. And the man’s eyes were opened and he saw what had been always hidden from his view. The healing power of clay (or mud) was a popular element of healing in the Greco-Roman world. But the “making of mud” in this passage is what causes Jesus some problems. The act of “kneading” (as in bread or, in this case, clay) was explicitly forbidden on the Sabbath. So, it was not the act of healing that prompted the questions but, rather, the preparation for it. The man was apparently fully attentive to who Jesus was and what had happened. The fact that in v. 12 the man claims not to know where Jesus is draws attention to Jesus’ absence in the following dialogue. Most of us probably don’t have a good idea of even why this was this way. Sabbath, or Shabbat, as we know, is supposed to be a day of rest, a remembrance of the seventh day of Creation when God rested, blessed this day, and made it holy. But we need to be clear here that “resting” did not really mean that God lay down and took a little nap; rather, God ceased creating. And we are called to do the same. Sabbath is not a calling to “rest”, per se; it is a calling to cease creating, a calling to quit trying to be God, to let God be God. So this kneading, this taking dirt and saliva and making mud was, in effect, creating. And they were right! Jesus was creating—he was creating mud, he was creating sight, he was creating life. No one could really prove or disprove what had happened. This man just saw in a way that he had not before. The obstacle proved to be not his disability but the fact that the ones who considered themselves the most righteous were blind to him and to the possibility that God had acted in his life. Once again, there is a certain dualism in the story. The children of the light are those that see Jesus and know him; the children of darkness do not. Here, too, there is a sort of “spiritual blindness”, those who cannot see Jesus for what he is but are instead wrapped up in seeing the world. Lischer also points out that the healing of the man takes two verses; the controversy surrounding it takes thirty-nine. That’s pretty interesting. At the end of this passage, Jesus says, “I came into this world for judgment so that those who do not see may see, and those who do see may become blind.” This season of Lent is as much about showing us our blindness, our darkness, as it is about bringing us light. For that is the way we see as God sees. It is a way of seeing anew, seeing beauty we’ve never seen before, seeing the Way of Christ. Rainer Maria Rilke said that “the work of the eyes is done. Go now and do the heart-work on the images imprisoned within you.” That is the work of Lent—to release us from our spiritual blindness, from our old way of seeing, frozen in time, and to light the way for a vision of eternity. b. How would you define “spiritual perfectionism” or “spiritual blindness” in this story and in today’s world? c. We tend to view this as a “miracle” or a “healing” story. How does it change if we view it as a commentary on our own lives?